Mark Sheppard isn't coming back and has made that pretty clear through his interviews - pretty sure Misha is. Cannot wait for the backdoor pilot of Wayward Sisters! No more Crowley? Boo. The stuff with Hell was boring and stupid, IMO, but I love Crowley anyway, and his interactions with the team always entertained me. I'm not sure the show could actually survive the loss of both him and Castiel, so it's good Mischa Collins is probably returning. Oh, and also: I was wondering if this meant we'd get (a version of) Bobby back, or if alternate-universe Bobby was more of a one-off. I'm hopeful for AU-Bobby, though I guess we'll have to wait and see. I too remember being very anxious to discuss the finale and all kinds of excited and now, I can't remember all of the details, sadly. I'm excited for the new season, though, and the possibility of Wayward Sisters. (Link for anyone who needs it). Oh, Mordax, I feel you on somebody else scooping an idea. Happens to me all the time... even with this show! I was gonna call a body-swap thing "Swap Meat" before this show did it! In your case I think you could maybe tweak the idea a bit and still use it. I don't even remember the melting footsteps thing on the show, so I doubt many other folks would think of it either. I'd be surprised if they don't do more with AU Bobby, assuming the actor is available. I was surprised they offed Crowley, but if we're being honest the character has been kind of spinning his wheels for a while. As great as MAS was in the role, it's kind of seemed like they were straining for stuff for him to do. (The same could arguably be said of Castiel, but if they wrote him out the fangirls would revolt and I would be there on the front lines.) I also wonder if they won't find some way to resurrect Crowley eventually too, even if it's just for the series finale or something. I'm not sure the show could actually survive the loss of both him and Castiel, so it's good Mischa Collins is probably returning. I think Misha's only going t be around for another 3 seasons, but I wouldn't worry; ten seasons after that, you'll barely remember he was there. I mean, come on, it's Supernatural: 20 million years from now, the arthopods who'll have replaced humanity as the Earth's dominant lifeform will be wondering if Krchk*crrk!Chk leaving will doom the show. Oh, Mordax, I feel you on somebody else scooping an idea. Happens to me all the time... even with this show! I have no doubt we will be getting some Mirror Universe Bobby. The question is what kind of role he will play? My prediction... He loved killing angels and holds a grudge, so he may end up a sort of big-bad for the next season. 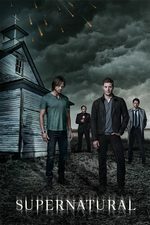 The Winchesters are forced to team up with the angels to take down their former mentor and father figure? Sounds like Supernatural to me. It also continues the theme from last season of a human big-bad. I'm excited to see how Cass will be revived this time. The fifth time is a milestone!